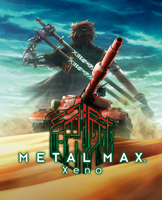 METAL MAX Xeno | NIS America, Inc. Celebrating its 25th Anniversary, METAL MAX Xeno is a new chapter in the venerated series! Join Talis, a lone wanderer, as he deploys his faithful tank to take on the harsh wasteland in this RPG of post-apocalyptic proportions. Humanity is on the brink of extinction. A mother computer known as NOA has become sentient and is destroying humankind. NOA's destructive reach has even reduced Asia's largest metropolis, TOKIO, to rubble. Explore this desolate wasteland as Talis, a casualty in this conflict, as he searches for allies and hope in a vengeance charged war against machines. • Style Your Tanks - Explore the barren desert, salvage new tanks, and upgrade them using over 500 parts! Customize your tanks with a fresh coat of paint and the strongest firepower you can find. • Fight for Humanity - The world has been devastated by a mother computer in its plan to eradicate humankind. It's up to you to explore the vast desert and unite with the remaining survivors to rise against the crazed machines. • Hold Your Ground - NOA's forces will track you down wherever you are! Make a preemptive strike on your foes when they appear on the World Map from inside your tank, or disembark and explore dangerous strongholds on foot with your allies.